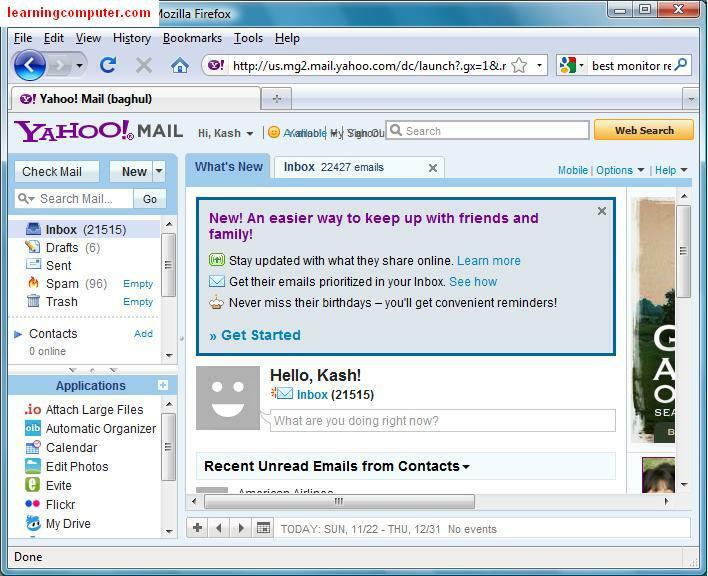 How to set up Yahoo Mail? Email is by far the most important means of communication in the world today. Not only is it the preferred means of communication for business purposes, it is more often than not one of the primary means of staying in touch with friends and family. 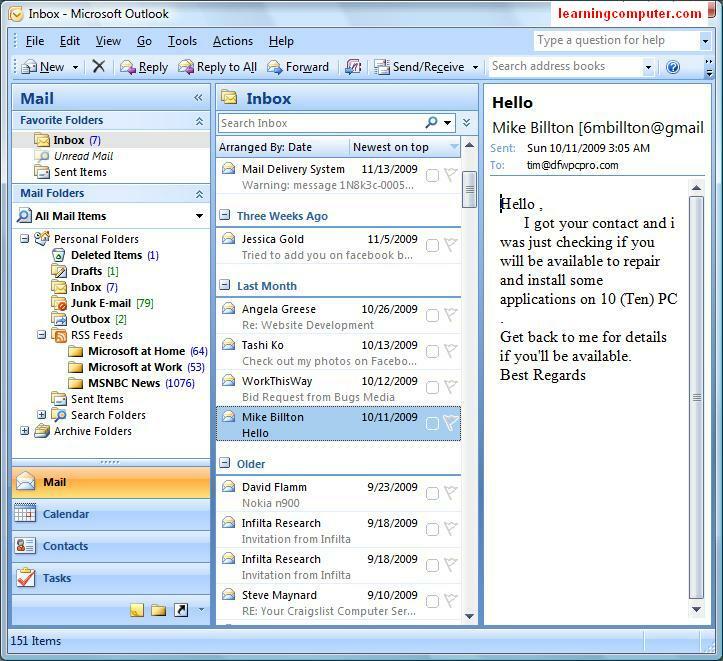 On any given day, you may be sending quite a few emails at work using a corporate email system like Microsoft Outlook and at the same time using many of the free web email applications like Yahoo Mail, Gmail or Hotmail for your personal use. Email is also known as e-mail. electronic mail, webmail, web mail, internet mail, and net mail just to name a few. For today’s lesson we are going to concentrate on Yahoo Mail (for personal use) and Microsoft Outlook (for work related). 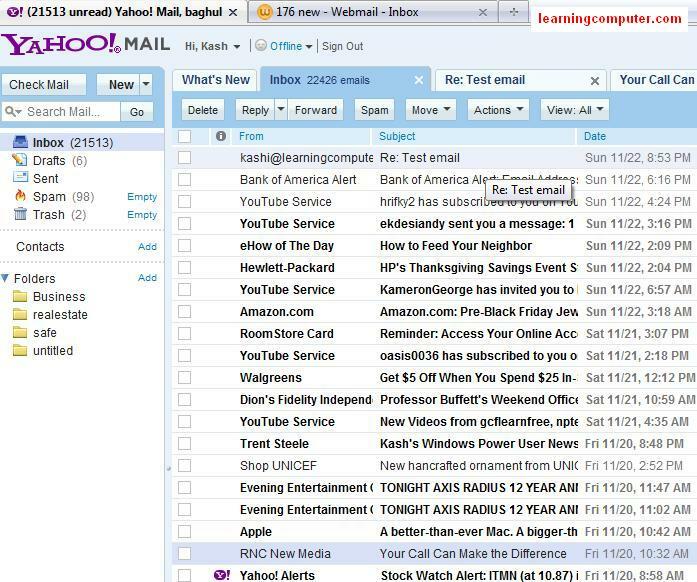 Yahoo Mail is one of the most popular webmail applications out there and it is also FREE to use. 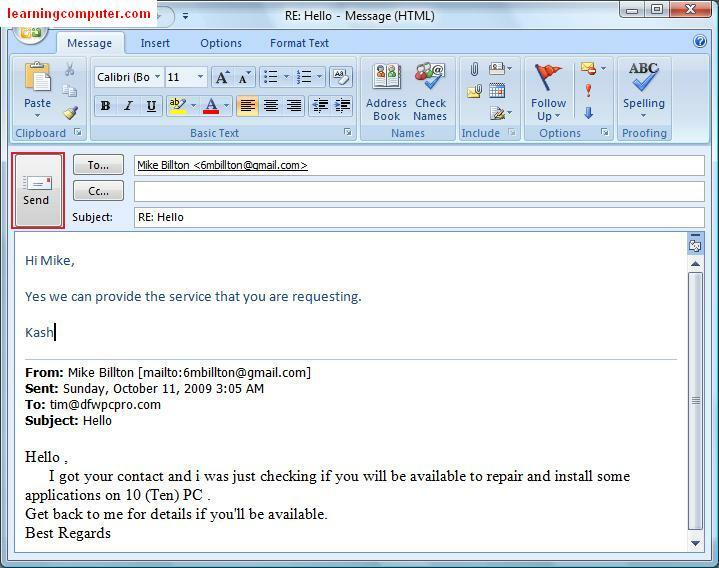 There are other popular web mail choices like Hotmail, Gmail etc. Many of them are pretty much the same in functionality, so we will just cover one of them today. If you do not have a Yahoo mail account, you can sign up for a free email account. You will need to enter some personal information in addition to username/password that will be used to login (sign in) to the Yahoo Email system. We have included a screen shot of what it looks like right below. 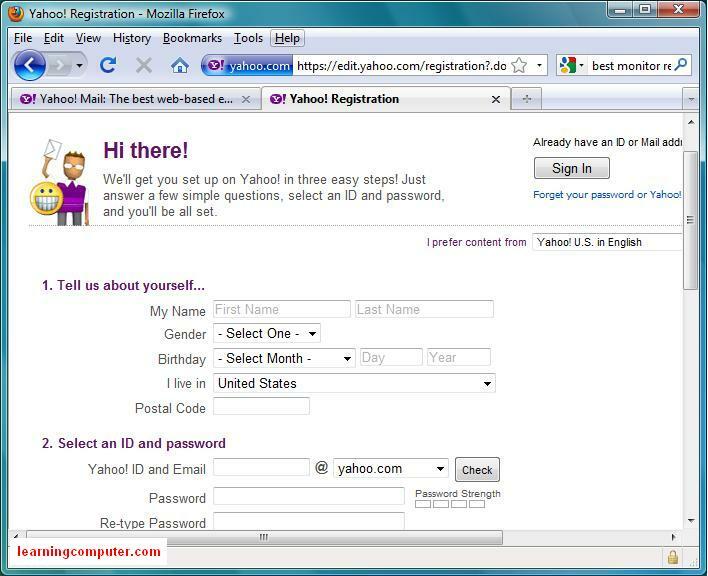 After you set up your Free email account with Yahoo, you will need to login or signin to Yahoo Mail. If you forget the website, an easy one to remember is this location, simply Mail . Yahoo . com. You will need to enter the same username and password used during Yahoo registration process for initial setup. In my case I have already logged into my Yahoo email account. After I pass through the login screen, I get into the email application. As you can see right below I have more than 20,000 emails!! I am either really popular or I get a few junk emails in my Yahoo mail account. I think the latter is true in this case. Here is a screen capture of what I am talking about. 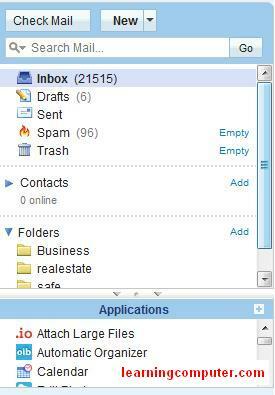 Right below the default mail folders, you will see a section for contacts. As you work with emails, you can add the email sender’s info to your contact list. This gives you the ability to have quick access to your personal contacts. You can also add additional info about your contacts here. Finally you will see some of my personal folders in Yahoo mail that I have customized in order to better organize my email. Doing this will also help you especially when you are trying to find an existing email that you wanna hold onto for future reference. I have shown a close up of these folders in the screen capture below. Right above the folders, you will notice the navigation tabs including commonly used features of using an email system like Yahoo. These include checking existing emails or sending a new email message. Let us look at these options one by one. When you are ready to create an email message, go ahead and click on the drop down arrow labeled New. From the drop down, go ahead and choose Email message. This should open up the new message window in Yahoo Mail, shown as follows. CC: cc stands for carbon copy and essentially it means that you will be sending you’re email message to another person as well. For our demo purposes, I’m going to skip over this part. Subject: You can enter the subject matter of the Yahoo email here. In this field I will go ahead and enter Test mail for now. Body: The big white rectangle is the actual body of your email in Yahoo Mail. Lets go ahead and enter some text here. Rich text: This is a new feature in Yahoo E-Mail that I really like. 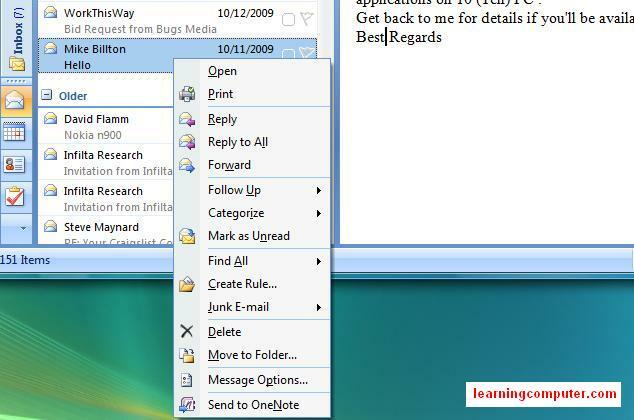 This option will enable a basic formatting toolbar for your outgoing e-mail. You can modify things like font type, font size, bold, italicize, underline and a few more formatting options. f you look right above the fields that we discussed, you will see additional command buttons so let us go over them real quickly. Send: You will need to click on this on when you are ready to send the Yahoo e-mail message. Attach: When you click on this button, Yahoo Mail will launch another dialog box where you can attach additional files (like Word document or Excel spreadsheet) to your email message. For now we are going to skip this part. Save Draft: This option will let you save an email message so you can review send it later in Yahoo. Spelling: When you are done creating an email message, it is always a good idea to check the spelling. When you click on this option, it will go through all your email and highlight any of the misspelled words. I think we are ready to send our Yahoo email now. Here is what the email looks like before I send it. After reviewing it, you can simply click on Send. – Try Microsoft Office Online Training – Two Thumbs up from US!! Before we move onto the next topic on Yahoo Mail, I would like to show you how the email that we just sent looks like at its destination site. 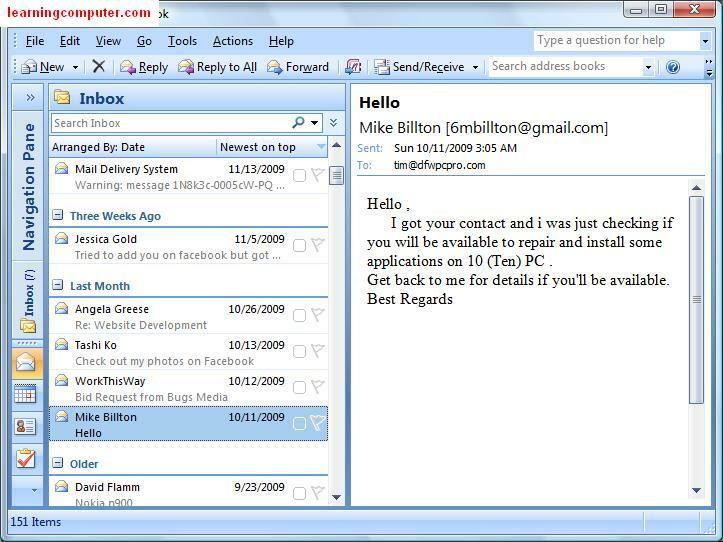 This is not Yahoo Mail system but a seperate email system. I have logged into yet another web mail client on my website (learningcomputer.com) and then clicked on the Inbox folder. Right below you will notice the last email I received is from Kash, my Gemini twin! Notice you will see similar items like To, From, Subject etc. I am going to click on Reply and send a quick note back to the sender, mum that would be Me! Now that we are done with creating and sending a new message, let us move onto the next topic, checking your email in Yahoo. Back in Yahoo Mail system, you will notice the first button on the left most part in Check Mail . Let’s go ahead and click on this one. When you do that, you will notice that the main window has changed and now you have a new tab (Inbox) with different options on the top. 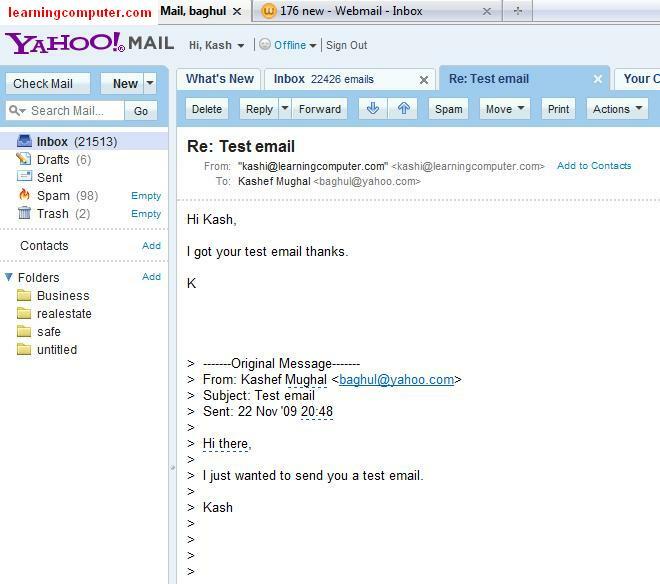 This is where you will receive new emails in Yahoo.com. Right off the bat you will also notice that the emails in the Inbox are sorted by date in a descending order. What this means is that the newest emails are on top and the oldest ones are on the bottom. The column headings are also clickable, so you could simply click on the headings like From to sort the emails by the sender. For this step, on our computer monitor this is what you see in Yahoo Mail. 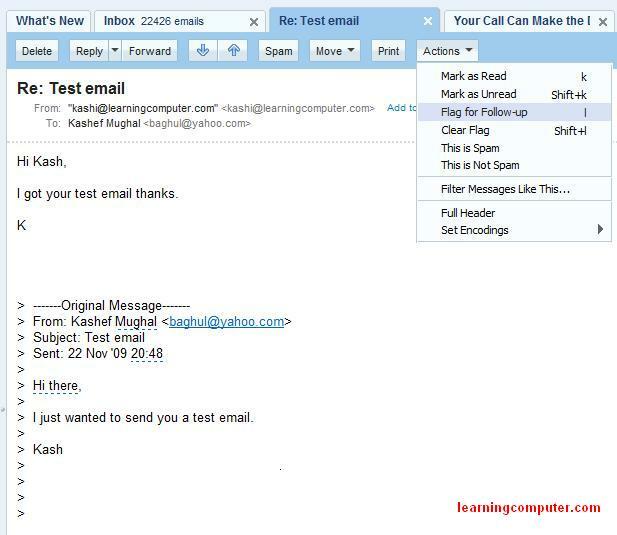 If you look at the first email, you will see that I did get a reply back from kashi@learningcomputer.com so let’s go ahead and check that out first. When you click anywhere on the item, it will go ahead and open up the new email message in the bottom pane. Here’s a screen shot of what I’m talking about in our Yahoo Mail account. Some of the items in the above figure should be familiar to you by now. You will notice that we have the subject of the mail highlighted on the top, followed by from, to and then the actually body of the email. In addition observe that this email attached the original e-mail message towards the bottom. This is useful when you are trying to work on something that came from another email source. Essentially it keeps a running log of the items that were being discussed in the incoming message. Spam: This is my favorite as it marks the Email as a solicitation and moves it to the SPASM folder. Move: This Button is useful when you would like to organize your email into personalized mail folders. For example if I received something on real estate, I could easily move it to the real estate folder. Actions: This is a new feature that gives you additional features to work with your electronic mail. You can do things like these: Marking an e-mail as already read, selecting all emails etc. We have included a screen shot of the available Actions in Yahoo Mail here. 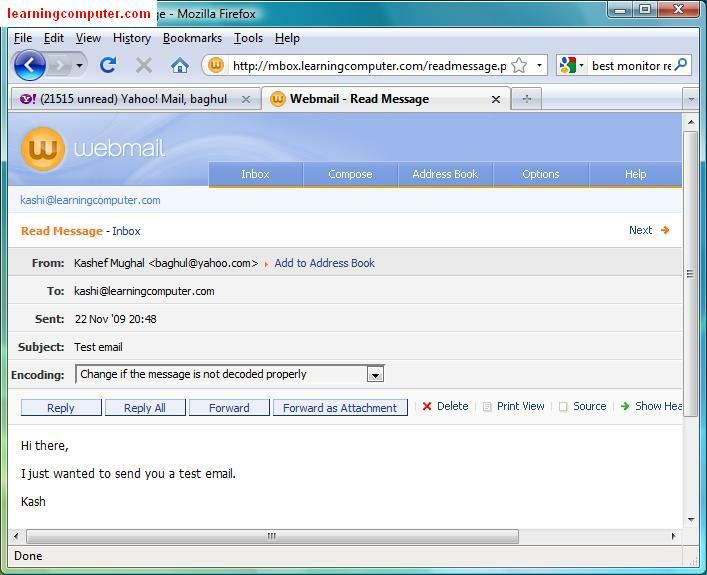 The last thing we want to discuss regarding Yahoo Mail is the ability to manage and organize your emails effectively. We already looked at one option of having personalized folders where you can organize your email messages. The other important item is search capabilities in Yahoo emails. 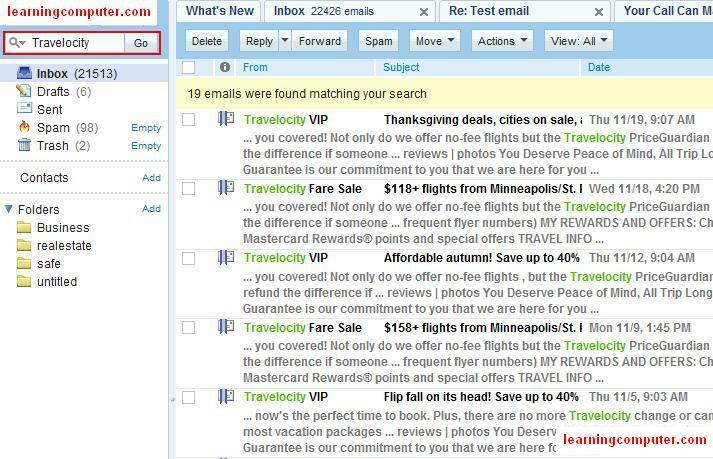 Let us assume that you are looking for e-mails from Travelocity. How would you do that in Yahoo Mail? One obvious way is to filter by sender, then browse through all the emails to see what you are looking for. A much easier way to do this is to use the built-in search mail functionality within Yahoo! Let’s try this out next. Go ahead and type Travelocityin the Search Mailbox (highlighted in Red) and then click Go. This will search through your e-mails in Yahoo Mail and look for the expression “Travelocity” either from the sender or in the body of the email, very cool indeed! This is a much more efficient way to work with your yahoomail rather than using the sorted list feature. Here is the output screen capture after we did the email search in Yahoo Mail. In addition there are other folders like Junk, Oubox and RSS Feeds. Besides the mail folders you will also see other options like Calendar, Contacts and Tasks. Just like the web email we saw in Yahoo Mail, you can click on these headings to sort the e-mails in a certain order. Moving onto the third pane which is the one to the right side. This is where you will find detailed information on your email. Most of these fields should be familiar to you by now, things like sender, to, subject, time of message delivery and the most important, the actual body of the email. Here we have included a screen capture of the list and detail pane views. Let us go ahead and reply to the above email message now. You can first select the e-mail that you’re working on from the pane in the middle. In order to reply, you can either choose a Reply from the tool bar above or use the right click menu. We have decided to use the second option which will give several choices in addition to Reply. You can see the right click menu in action below. After you select Reply from the previous step, this will open up a new window as shown below. 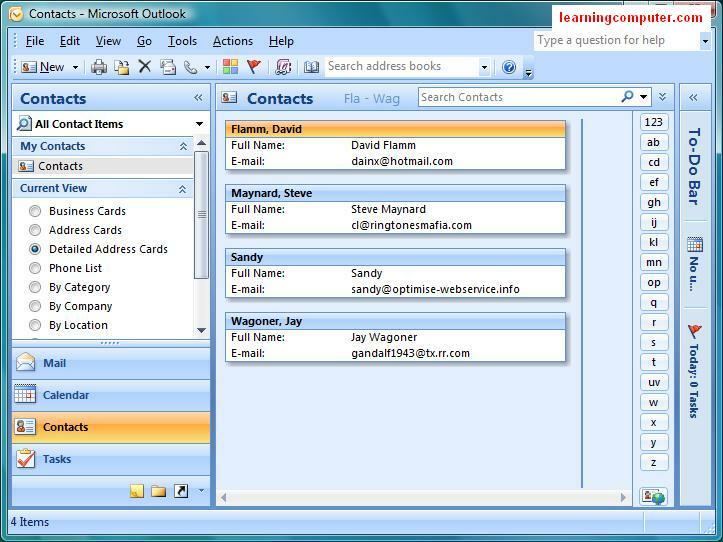 Notice this window uses the new Ribbon layout that is a new feature for Office 2007 Mail system. The different actions are organized by function which makes it much more intuitive and easy to use. We are going to add some text to this email message and then click on Send button. Here is what is looks like. Create – New Message to Contact.